See Michelle's reader contributions over here, if you haven't already. Michelle Malkin is calling for everyone to fire up Photoshop yet again. This time, we're instructed to come up with our best parodies of an undying idol of the Left, Chairman Mao. As you'll recall from last week, we just found out that his portraits were fakes, so it's not like he'd mind the mockery, right? I'll be posting mine shortly. Stay tuned, and feel free to share yours down in Ye Comments section, as always! 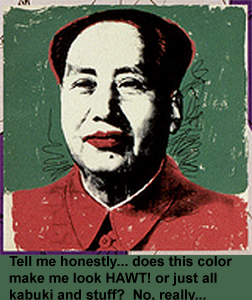 Mao in the digital age. Srsly, m i hot rnot, k? I put mine up at http://www.theundergroundconservative.com/. Sorry I didn't put up the entire URL but when I previewed my comment, the system cut it off. It's the second post now (Jan. 16).